North Georgia's preferred Tree stump removal service and tree stump grinding specialists. We provide prompt, courteous service with free estimates, and affordable pricing. We turn your unwanted stumps into useful mulch. 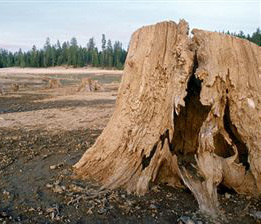 Specializing in grinding stumps makes us the low-cost alternative to Tree Companies. Our affordable rates are more cost efficient than renting a stump grinder. 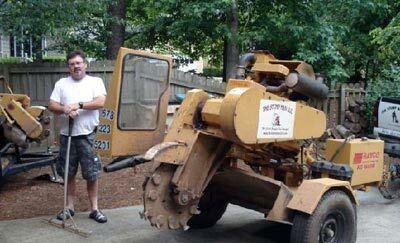 The Stump Man only specializes in Stump Grinding. We do not cut trees or grass. We do not haul debris or lay sod. However, we do contract for 11 different Tree Service Companies and can recommend a good one if you like. Be careful when hiring any company that will be using dangerous equipment on your property. Always check their Insurance Policy and Business License. The Stump Man carries $1 Million Liability Insurance for your protection. You do not want a "Dabbler" or an uninsured "Copycat" company (some try to ride on our good name) grinding your stumps. You may get a teenager with a rental machine tearing-up your property. You want a BBB Accredited Skilled Professional that only does One Thing- STUMPS! We have Self-Propelled, Lawn Friendly Machines that fit thru a 36" gate. We also have Tow-Behind Machines that can handle uprooted, blown-over stumps. It is better to say "This one thing I do" than to say "These forty things I dabble in"